UC Berkeley nuclear engineering graduate student Cristhian Galvez recalls spending his childhood at a power plant in Peru where his father worked as an engineer. Galvez-whose grandfather was also a power plant engineer-acknowledges that without his early exposure to the power plant, he might not have become interested in nuclear energy. On campus, his research simulates nuclear reactions in the nuclear thermal hydraulics laboratory headed by nuclear engineering professor and Department Chair Per Peterson. The lab primarily conducts research on theoretical, fourth-generation nuclear reactor models that could potentially produce electricity more safely and more efficiently. "(The research) is, of course, aimed at developing technology that would provide energy at lower costs, so that's the higher level of safety and security," Peterson said. Like other labs around the country that conduct nuclear research, Peterson's lab researches reduced-scale models of risky, capital-intensive technologies. "You want to build up your understanding of the technology by doing scaled experiments, computational work, simulation work that we do in the lab," said Edward Blandford, a nuclear engineering graduate student and member of the lab. "The nice thing about the reactor concepts is that we can do reduced-scale experiments at prototypical conditions." 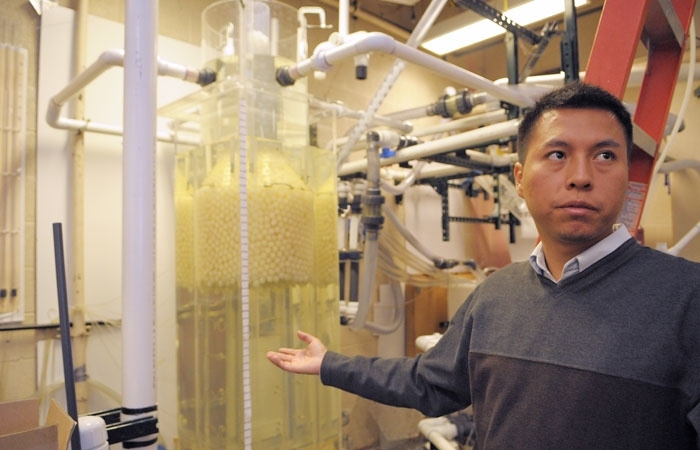 He said that although the practice of using reduced-scale technology to understand key facts about a system is common in the energy industry, what makes the lab on campus unique is its focus on liquid salt-cooled reactors. "We're able to reach what we call higher physical similarity, which means basically more accurately representing the prototypical conditions than other reactor types because of the fluid, the materials we've selected ... in this case the molten salt," Blandford said. "It allows for doing things that are reduced scale quite a bit easier than say other reactors ... where these types of experiments are quite a bit more costly to do." According to Peterson, the salts used in the reactor cooling are a clear liquid similar to water. Since salt boils at a much higher temperature than water, it stays in a liquid phase at the higher temperature. Galvez said he enjoys his work because the research can lead to energy solutions for developing countries that are not able to generate hydroelectric power. But unlike other fields of research, developments in nuclear engineering occur very slowly, he said. "It's high investment-high risk," Galvez said. "Many studies have to be done before any investor, any industry takes that step. However, after you pile up all these studies, all these years of expertise, all these people all over the country, all over the world, it all comes together eventually, and you do get a big project that can provide solutions."